Tom Weiskopf was born in Massillon, Ohio, United States in November, 1942. His best years as a golfer were between 1968 and 1982, when he won 16 PGA Tour Titles. In 1973 he won The Open Championship wearing the Charcoal Legend Jumper by Slazenger. As we said, he was born in Ohio, where he went to High School to study later at the Ohio State University, where he played on the golf team. In 1964, being 22 years old, he turned professional. His best tournament was the Kemper Open, which he won three times. His best was, by far, 1973. In that year, Tom Weiskopf won seven tournaments, including the mentioned Open Championship, he won it at Royal Troon. According to Mark McCormack’s world golf rankings, he finished 1973 ranked second only after the Slazenger legend Jack Nicklaus. Although the 1973 Open Championship was his only major winning, he was a four-time runner-up at The Masters, and also had a T2 finish at the 1976 U.S. Open. Another good tournament for him was the Canadian Open, which he won twice, in 1973 and 1975. The second win was dramatic, with a one-hole playoff again Jack Nicklaus. He also played the Ryder Cup in 1973 and 1975 in the United States Team. Tom Weiskopf and his swing will always be admired in the golf world. He had a rare combination, as he hit the ball high, generate a lot of power and also had a good control of the ball. His temper on the golf course got him the nickname of “The Towering Inferno”. In Slazenger, we feel honored to say that Tom Weiskopf was wearing the V-neck Slazenger sweater when he won his only major. 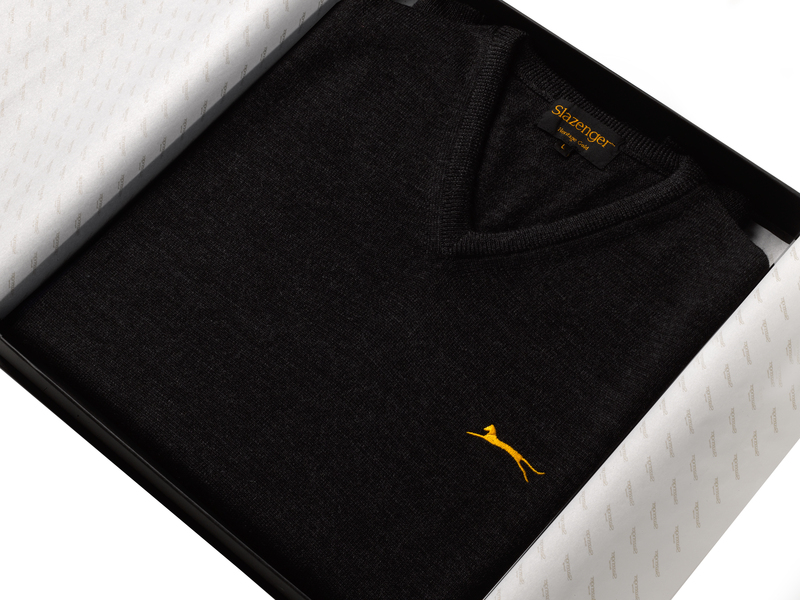 for that, we wanted to tribute him making the Charcoal Legend Jumper by Slazenger Heritage, inspired by the one he wore in 1973 to win The Open Championship.